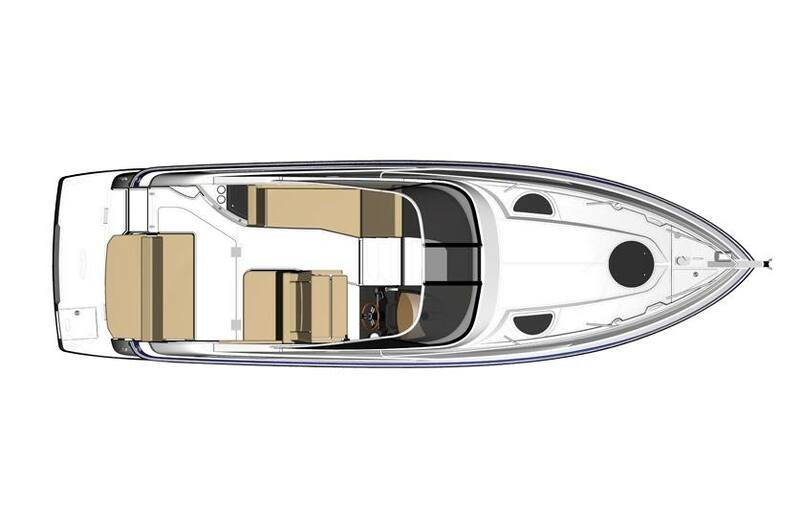 UltraLounge: The UltraLounge creates the most versatile transom in its class. Queen Sized Berth: A full queen sized berth is something you have come to expect, but only from Regal. Hull Side Picture Windows: You might forget that you are in the salon with the amount of light you get from the hull side picture windows. Largest-In-Class Head: The largest-in-class head features 6-foot head room, black cherry cabinetry, a dedicated shower, and solid surface counter tops. 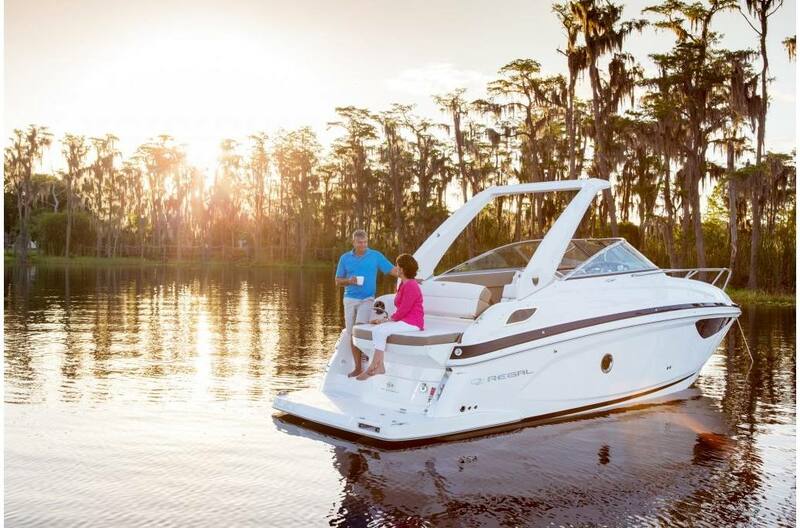 Dockside Power: A 30 amp shore power connection and 50 foot cord are standard on a Regal. 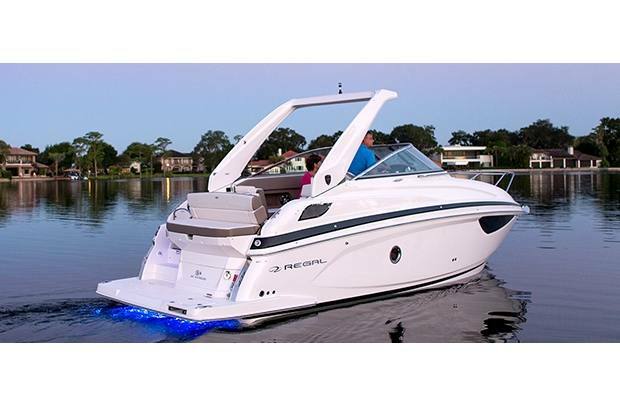 Dual Battery Switch: Regal features a smart battery management system. Using one battery for starting and the other for all your electronics. Of course they are both equally charged via a VSR and can be combined for emergency situations. Hanging Rack: The 28 Express allows you to bring many things, but with plenty of hanging space to keep clothes wrinkle free, an iron won't be on the list. 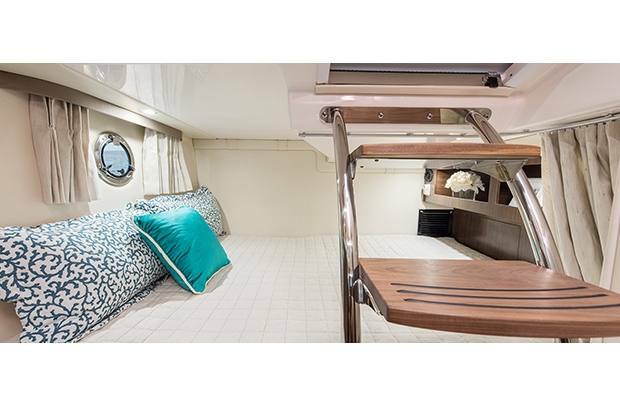 Hull Side Picture Windows: Just because you go below decks doesn't mean you should leave the view behind. 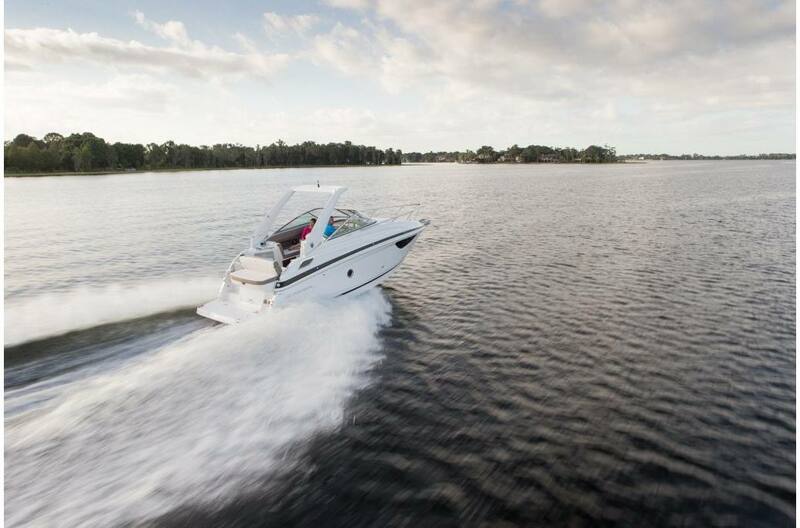 The 28 Express is the only boat in its class that features hull side windows. LeatherCrest Cabin Upholstery: LeatherCrest provides the warm look and feel of leather but is easier to maintain. Electric Burner Cook Top: The features a single burner stove perfect for the master chef in the family. Hand Crafted Cabinetry: The walnut cabinetry looks stunning as you enter the cabin. Even more stunning is the finish both inside and out of cabinets and drawers. Stainless Refrigerator: The 4.2 Cubic Feet refrigerator is big enough for all your food on a very long weekend. 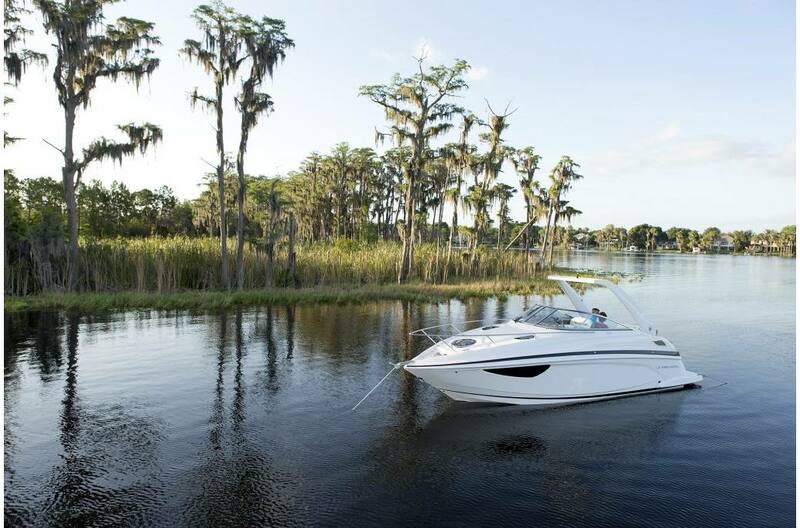 6' Head Room: The 28 Express features the largest head in it's class, including 6-foot standing headroom. Face-To-Face Cockpit Seating: Versatility. Use your cockpit for face-to-face seating for four or lounging and sunbathing for two. 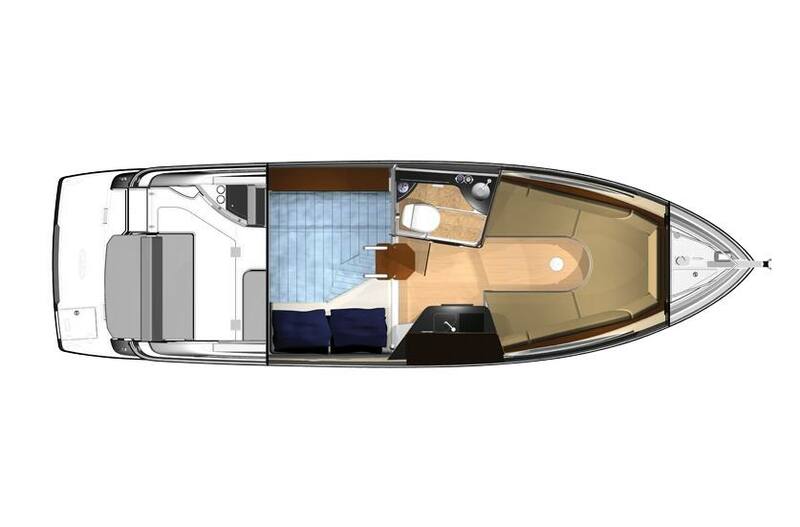 Foredeck Steps: The foredeck steps are very wide and integrated into the door. Upgraded with Harken bearings, the steps can easily handle the added stress. Refreshment Center: For those looking to entertain, the standard refreshment center with sink, cup holders, and cooler is the perfect fit. Removable Cooler: The 28 Express features a removable 25 quart Igloo cooler that will handle even the thirstiest of crews. 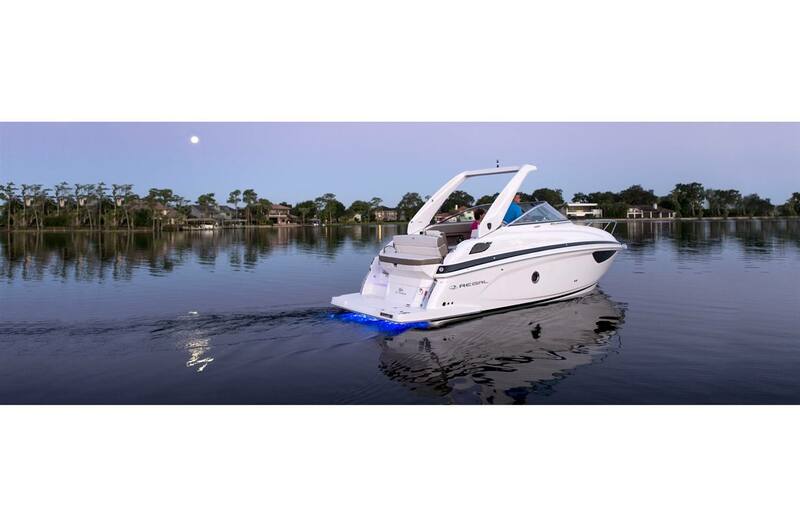 UltraLounge: The UltraLounge gives the 28 Express transom all the versatility of a bowrider with the functionality of a cruiser. Upholstery Packages: Choose between Gulf Coast White or Tuscan Horizon two tone. 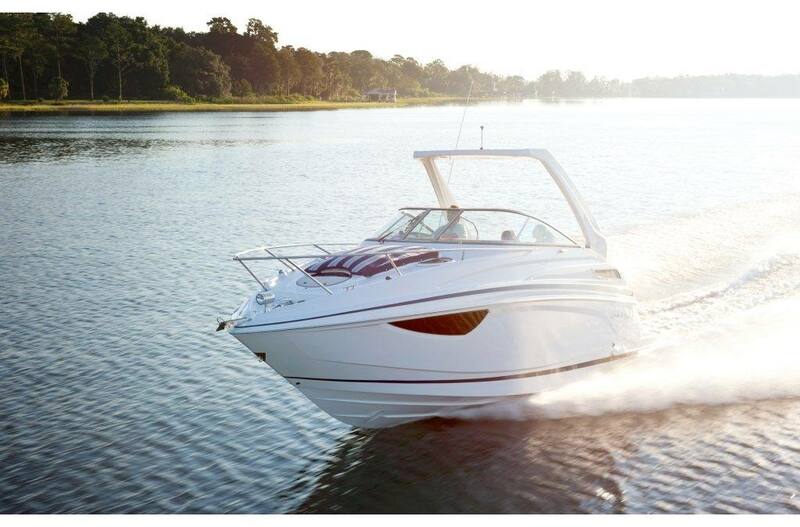 Anti-Glare Dash: Regal Express cruisers feature dashes with an anti-glare finish at the helm to give you a clear eye on the horizon at all times. 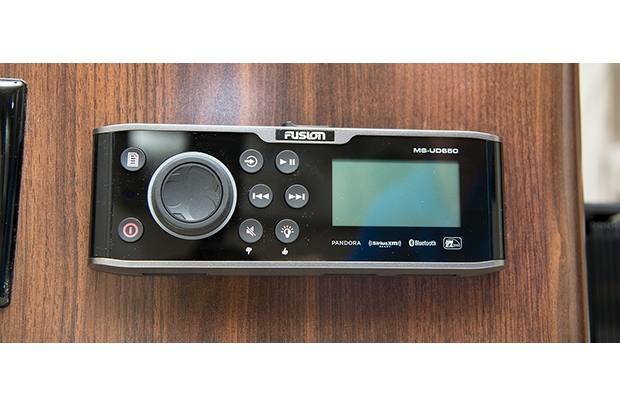 Fusion NRX200i Marine Stereo Remote: When you're ready to take control of your tunes, the Fusion remote gives you complete access to all of your music. Hand-Wrapped Steering Wheel: Regal's feature a premium hand wrapped steering wheel, an option on many competitors. 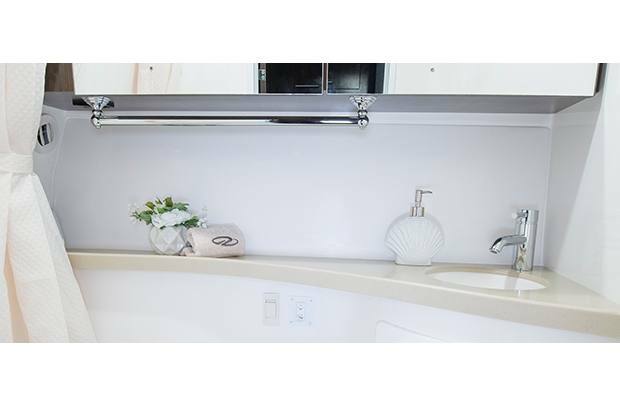 Bow Rail: The one piece bow rail is made out of 316-grade stainless steel. Deck Hatch with Privacy Screen: Let the cool weather in but keep the bugs out with the deck hatch and screen. Dockside Water Inlet: Keep your water tank full, you never know what the day has in store. Deck Vents: Along with the large picture windows in the salon, two overhead deck vents will make this the brightest express in it's class. When weather permits, open the deck vents and allow the breeze to flow through. Electric Forward Opening Engine Hatch: Aside from superior engine room access, the forward opening engine hatch keeps routine service and maintenance out of the cockpit. Fender and Dock Line Storage: When your ready to start your cruise, dedicated storage for all your fenders and dock lines will make it easy on the first mate. Neutra Salt - Available with Volvo gas engines. Anchor Windlass & SS Anchor - All Chain - Enjoy added durability when anchoring. 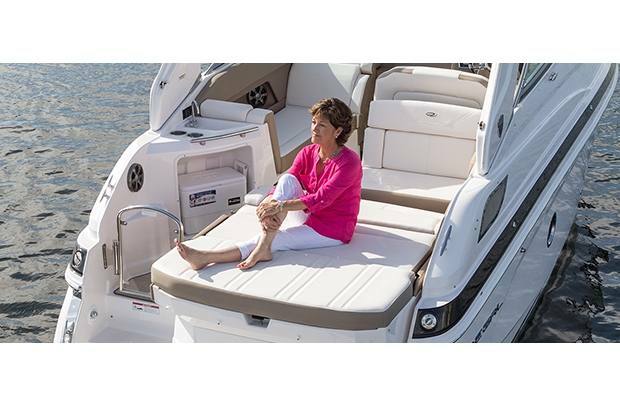 Foredeck Sunpad - It's the perfect place to get some sun and enjoy the fresh air. 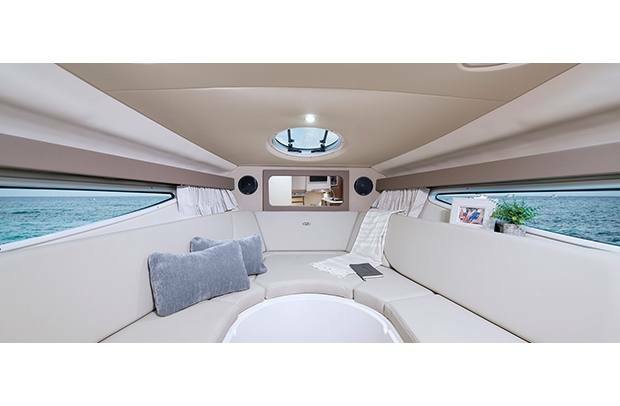 TV - Flatscreen with DVD player - Enjoy all the luxuries of home, while on the water.